When Kyle and I first climbed Mt. Humphrey in Arizona we made a pact, feeding off the exhileration of the moment. We decided, adding to the list of adventures we had planned, that we wanted to climb to the highest point in every state (continental US, Denali seems a bit to intimidating to tackle….yet). Before the trail we managed to knock out two, Humphrey and Guadalupe Mountain in Texas. On trail we also ticked off a few other mountains: Mt. Katahdin in Maine, Mt. Greylock in Massachusetts, Mt. Washington in New Hampshire, and Clingmans Dome in Tennessee. However, along the trail a few high points were within our grasp but managed to elude us. We hiked within a mile of the Mt. Rogers summit, the highest point in Virginia, but with a thunder storm rolling in, we had to head towards the shelter instead of taking the spur trail up to the top. In New Jersey we had the option to take a side trail to the High Point but because of bugs, heat, weariness and general misery we chose to skip it. In the end we had to decide that hiking the AT wasn’t about high points, it was about the trail and any that we achieved along the way were bonuses. But now that the trail is over we can begin our slow quest for peaks again. So when we were looking for places to stop and hike in North Carolina we decided to head to Mt. Mitchell State park, the highest peak in North Carolina at 6,638 ft. 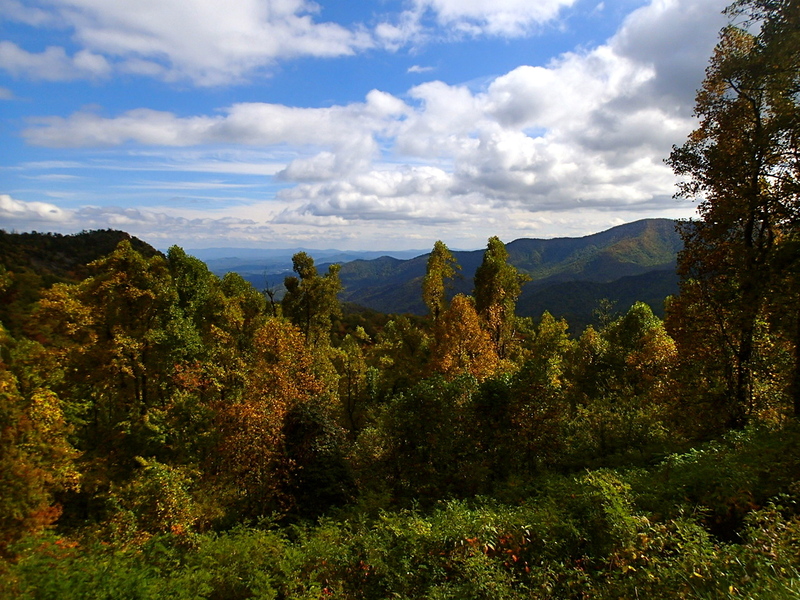 This also makes it the highest peak in the Appalachians and east of the Mississippi. Kyle and I were exstatic, we were climbing mountains again, and looking at the comparison between it and Katahdin we figured, this mountain is going to be huge! Of course, that was before we discovered you can’t actually hike to the top of the mountain. You have to drive. Mountains that you can drive to the top of tend to infuriate me, but there were some backcountry sites that we could hike into so we went. We got there a little late and hiked into the closer backcountry site, clearly throwing the park ranger for a loop by asking questions about available water sources. It felt so good to be back out in the woods, building a fire and sleeping like babies in our zero degree down bags. Next day the real adventure began when we chose to head out on a bridle trail, take a connecting spur trail called Big Tom trail up to a ridge trail that would lead us back to the parking lot where our car was parked. The bridle trail was beautiful, a little muddy, but it took us in and out of the mountain’s contours, providing some nice views of the burnt orange and firery red hillsides. But when we reached the Big Tom trail we discovered that what was supposed to be a trail was more like not a trail… We began following what we thought was a trail, only to admit ten minutes later that we were really just hiking up hill along drainages. We knew that the ridge trail was running perpendicular to us, somewhere up above, so theoretically if we kept going up we would have to hit it at some point. The scary thing was, what was going to happen when we got to the top, couldn’t find the ridge trail and then had to go back down in hopes of re-finding the trail at the bottom? Luckily it never came to that, we popped out on the Deep Gap trail and breathed a sigh of relief. Exploring Mt. Mitchell hasn’t been our only adventure. We also stopped in Asheville, had a fantastic meal at the Wicked Weeds brewery and explored downtown. 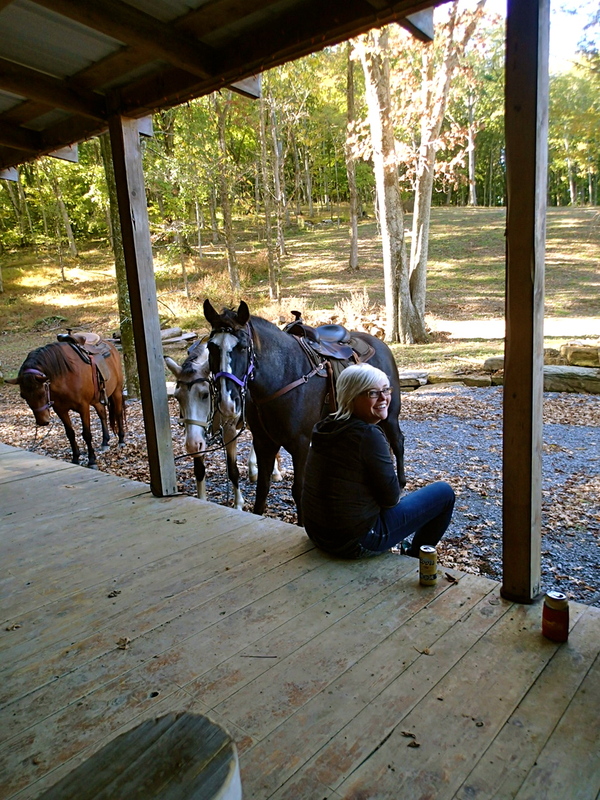 Then we headed to Tennessee to see Kyle’s sister Corri and ride some horses. 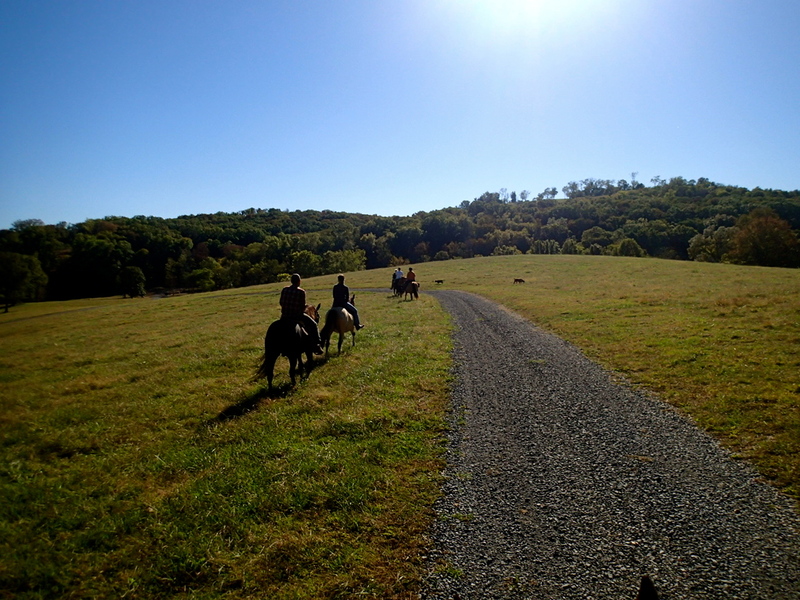 Corri took us and Kyle’s cousin Ben and girlfriend Amara on an amazing twelve mile ride, exploring her friend EBs parent’s 500 acres of rolling green lush land. 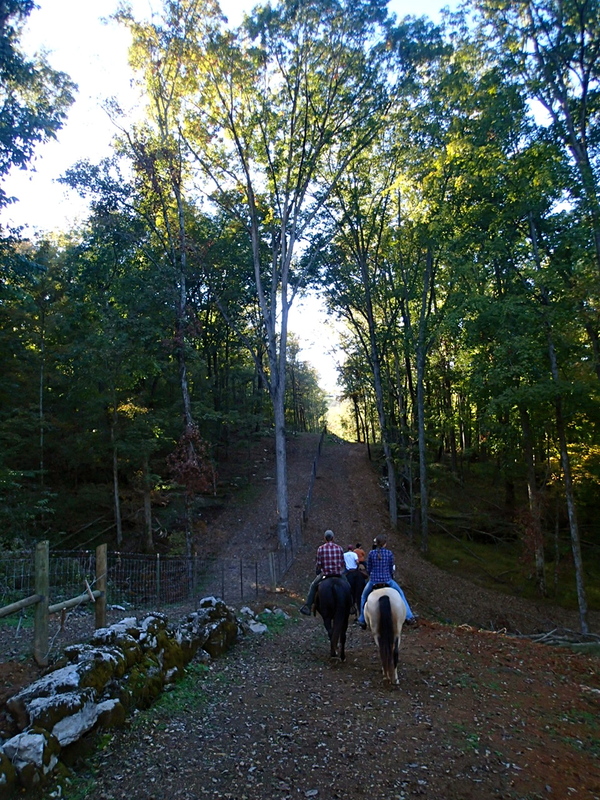 We went up and down steep hills, across rivers, saw beautiful sights and laughed as her dog Frank joyfully chased cows. Of course, everyone else loped along on long legged steeds but when they took my horse out of the trailer she stood a good few feet shorter then the rest. She was a legitamate pony and as a result her little legs couldn’t keep up with everyone else and we found ourselves lagging far behind. Before we left Tennessee we headed to the Jack Daniels distillery to take a tour. Now here is the ironic thing about the Jack Daniels distillery, it is in a dry county… so they can’t actually serve alcohol or sell it. But there are always ways to get around the rules. At the Jack Daniels distillery they have a bottle shop, where you can buy commemortative or special edition bottles, and inside the bottles there just happens to be free whiskey… very clever Jack Daniels. Now we are in Fort Wayne, IN, relaxing with the extended family, heading out fishing, and gathering our halloween costumes for this upcoming weekend. Enjoy some pictures from our recent adventures. Haha, we had considered going to Mexico at one point but money money money. Plus, getting to visit all our friends and family across the country can’t be beat!